· 3 were actual novels. Most were awesome! 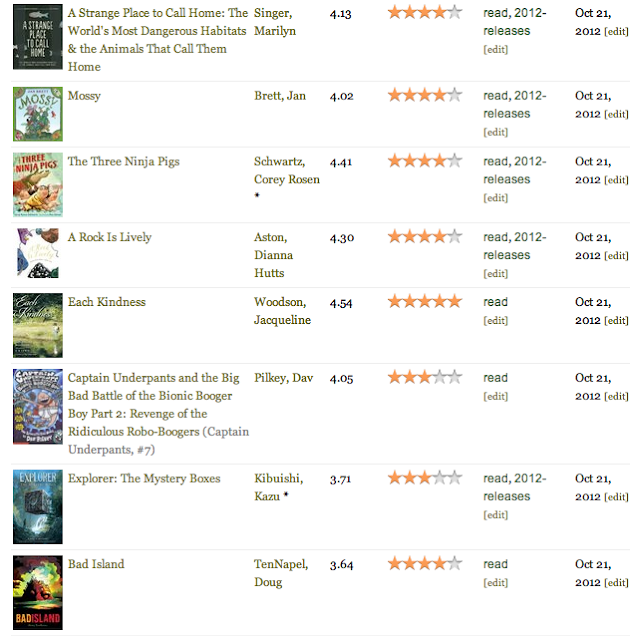 So many great books out there, I wish I could read more. I also have 30 books I’ve ordered through inner-library loan. (Cybils) Hope they all arrive soon! I’ve been waiting and waiting for Cece Bell’s Rabbit and Robot: The Sleepover and I’m glad to say it did not disappoint. 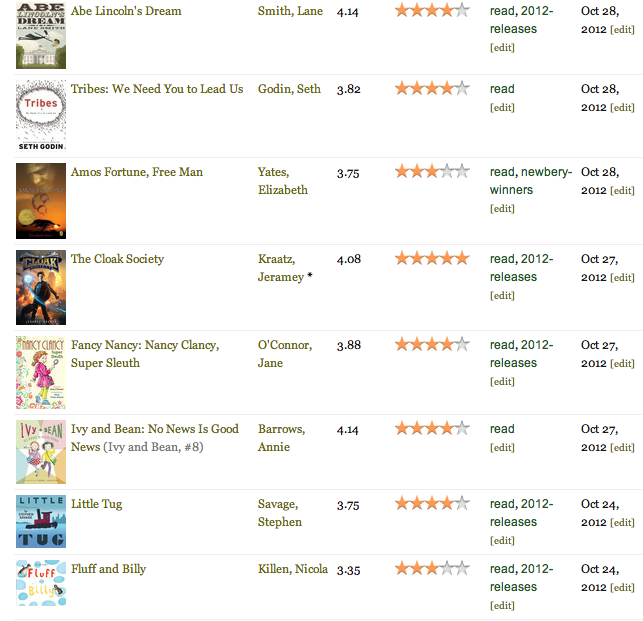 My normal reading fare doesn’t usually contain as many early chapter books and easy readers as it has this fall. However, this year I’m lucky to be on the Cybils committee for those books so I’ve read my fair share. Bell’s Rabbit and Robot is one that I adore. 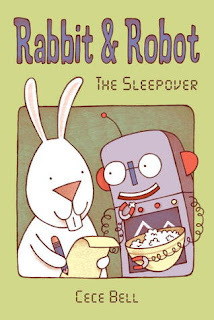 Rabbit and Robot follows the story of two friends who are having a sleepover. Rabbit has created a list of things they need to do at this sleepover, and the order in which they should do them. Each chapter follows the friends as they check one more item on the list. 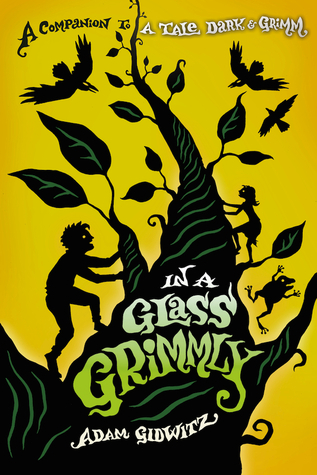 As I read this book I was continually reminded of another pair of friends whom star in an early chapter book series – Frog and Toad. 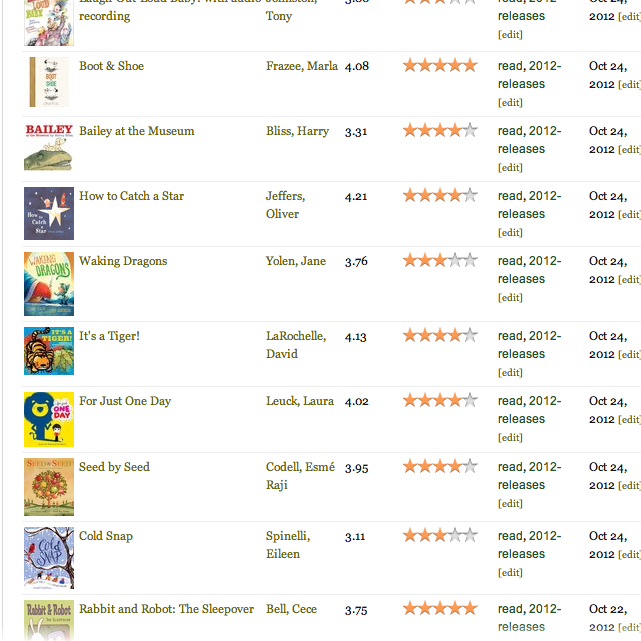 I loved the Frog and Toad books growing up, and as teacher in the lower grades as well. I thought they were the perfect characters to teach – my students and I had wonderful conversations about the two friends. Rabbit and Robot gave me the same feeling as Frog and Toad did, and I immediately wanted to share the story. The first child who read it was my son, Liam. We were early for the bus stop outside my school so he and I took turns reading each page. After about ten minutes of reading I noticed I had a larger than average group of children gathered around me listening as we read the book. I smiled as a middle school student asked me if I was going to finish. A good story transcends the age it is written for – and this book does just that. In my classroom Rabbit and Robot is on display with the other books for the November Sharp-Schu book club. 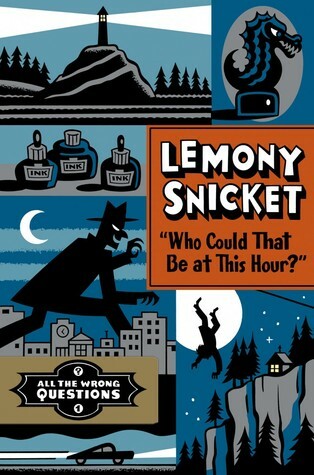 Fifth graders are in love with this book and clamoring for more. Their expression when I tell them that this isn’t a series (yet, I hope) is priceless. I highly recommend the purchase of Rabbit and Robot: The Sleepover. It is the perfect early chapter book. See, sometimes fifth grade children don’t exactly stand up and cheer when I say it’s time to write. Some do, but several this year ask if they can keep reading. They don’t see the purpose. Many of them have not had a workshop class before. They really just want me to tell them the assignment, they want to write a rough draft and final draft (that are pretty similar) and be done. They look at me as I talk about audience, stretching as a writer, craft choices – and I clearly understand that they think I’m crazy. The other day as I was writing in front of them for our mini-lesson I simply stated that their words matter –that their message mattered. I had a few heads nod and many of them looked at each other. I tried to impart the impact words can have on others. I don’t think they believed me. And then, I thought about it. What exactly was I trying to say? How do my words matter? It was something I kept thinking on. Shortly after that lesson I came across the following blog post (HERE) from Jessica Lahey about how our words matter as teachers. The impact an email can have on a parent. What an excellent reminder for me, especially during the two weeks of parent-teacher conferences. And the signs kept coming. I had wonderful messages from blog readers, emails from friends who liked my poem about Vel. Stacey at Two Writing Teachers wrote a poem inspired by it (HERE). My students told me that the poem moved them, which is a high compliment from them. And then I went to Vel’s funeral today. The shock of flaming red hair. Holy smokes, I thought, that’s my poem! And I listened as she read it, and people nodded. Wow, what a powerful experience. It seems my dad had passed it on to the minister so she’d know Vel. She had decided to read it. And as people came up to me to tell me how much they enjoyed it, I though of the power of our words. What I need to teach my students is this. Words can tear people down. Words can build people up. Words can speak your message for you. Words can bring us together. And I realized how grateful I was. To friends who took the time to read my blog and comment here or to me. To strangers who do the same. To students who share their writing with me. To my parents for showing that the read my writing and liked it. To a stranger, a minister, for sharing it with others. Words do matter. I can’t wait to talk to my students tomorrow. Today I heard the news I knew was coming, but dreaded anyway. A family friend had passed away. I call her a family friend even though I really just thought of her as family. We were her family, she was ours. And while her last few years have not been what she would have wanted – aging and Alzheimer’s will do that to a person – that doesn’t diminish the amazing life she led. And so, as I sat down in writing workshop to write beside my students today, little nod to Penny Kittle there, I had a few memories flood in about the amazing person that Vel was. I felt like I needed to share, needed to put this out there. Vel was not a person to seek the limelight, but I want to remember her anyway. Vel was a teacher in the 50’s, an elementary principal after that. She married Wick, who taught PE. They both love antiques, reading, a good story, and Door County. Wick passed away several years ago. 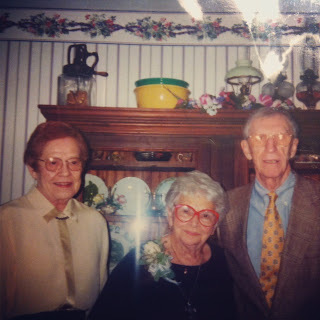 I smiled today with the idea that maybe they are together now, sharing stories, and catching up. The quiet interest she’d take in you. How in a conversation you felt listened to. Her infamous mac and cheese. The way she and Wick would pick out antiques. Her love of Pepperidge Farm cookies. Meeting my granddad and Col.
How they brought her home to their wives. Her comparison of marriage to WWII - hilarious. And how she’d greet you. Her gaze would lock in on yours. But hadn’t even realized it. Godspeed, Vel. We'll miss you. week. Join us! Go to their site and link up your own blog. A trip to Anderson’s Bookshop on Friday resulted in a bag of new books to add to my already bursting “to read” shelves. Read several of them this weekend, however, because many were short. The great part? All were amazing! 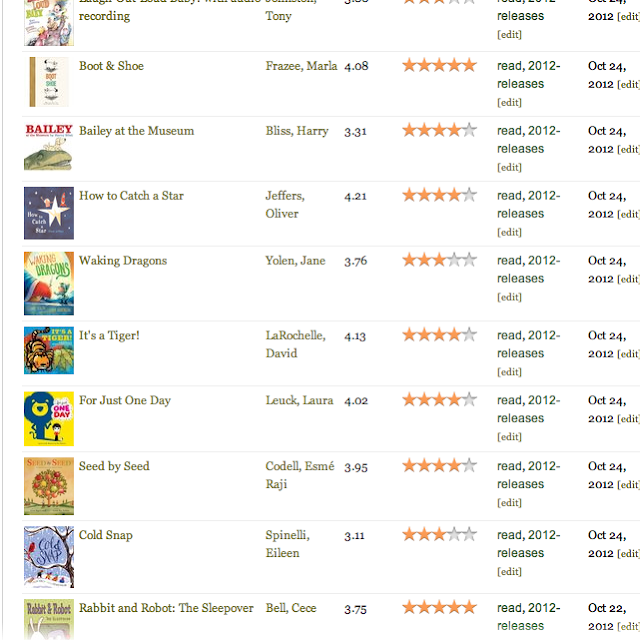 Which just makes me want to read the other books on my shelves – what fabulous books are waiting for me to finally get to them? My plan for this week is to finish Cloak Society – wonderful so far, and then read Tribes by Godin which I purchased on the recommendation of Donalyn Miller. Looks great!